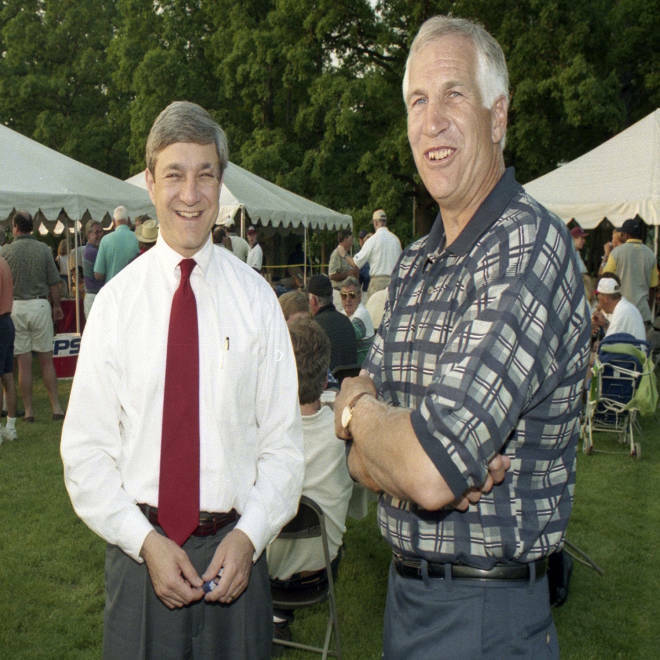 Former Penn State University President Graham Spanier, left, and former Penn State assistant football coach Jerry Sandusky, attend the Second Mile Celebrity Golf Classic, in State College, Pennsylvania, in 1997. The Penn State University president forced to step down by the sexual abuse scandal that rocked the school on his watch broke his silence about the ordeal in an exclusive interview with The New Yorker this week. Graham Spanier, 65, said he "is in a mode of substantial grief about what happened to those kids," referring to children sexually assaulted by former Penn State assistant football coach Jerry Sandusky. But Spanier told The New Yorker that he rejected the damning assessment in the Freeh report laying out how university officials failed to stop Sandusky from sexually abusing boys on school property. "The Freeh report is wrong, it’s unfair, it is deeply flawed, it has many errors and omissions," said Spanier, speaking to New Yorker reporter Jeffrey Toobin. "They interviewed, they say, over four hundred and thirty people; many of those folks have spoken to me about their interviews. Many of them describe those interviews to me as a witch-hunt." Sandusky, 68, was arrested in November 2011 on charges that he sexually abused boys as young as 10, many of them encountered through his charitable foundation for disadvantaged youth, Second Mile. Sandusky was found guilty of 45 counts of child sexual abuse. He is in jail awaiting sentencing. The Freeh report, released July 12, looked into the role of individuals and the institution of Penn State in failing to stop Sandusky. It focused on two incidents — a 1998 sexual abuse complaint that was investigated by police and a 2001 eyewitness report of Sandusky apparently involved in sexual activity with a 10- to 12-year-old boy in a shower. The 276-page report on the findings from a special investigation led by former FBI Director Louis Freeh named Spanier one of "the four most powerful people" at Penn State "who failed to protect against a child sexual predator harming children for over a decade." The other three are former head football coach Joe Paterno, who died in January, former Penn State vice president Gary Schultz and former university athletic director Timothy Curley — both of whom are charged with failing to report the allegations of sexual abuse by Sandusky, and of committing perjury when questioned by a grand jury. Their trials are expected to begin in early 2013. Spanier was forced to step down as president but remains on staff as a tenured professor in the Sociology Department. He is not charged with anything. According to the Freeh report, however, "Spanier failed in his duties as president" in handling reports related to Sandusky. It said Spanier and others "repeatedly concealed critical facts relating to Sandusky’s child abuse from the authorities, the University’s Board of Trustees, the Penn State community, and the public at large." Penn State, now led by Rodney Erickson, accepted Freeh’s findings in their entirety. In the lengthy interview with The New Yorker, Spanier, said he can recall only one substantive conversation with Sandusky in his career. He disputes that he had any knowledge of sexual abuse, maintaining that the incident had been presented to him as unseemly "horseplay" in the shower, and then handled without apparent need of his intervention. "I never, ever heard anything about child abuse or sexual abuse or my antennae raised up enough to even suspect that," Spanier said in the interview, who maintained that the email cited in the Freeh report was taken out of context to support a false conclusion. He rejected the notion of a cover-up. "I’m very stunned by Freeh’s conclusion that — I don’t think he used the word 'cover-up,' but he uses the word 'concealed.' I’m totally stunned by that, because why on earth would we? There’s no logic to it. Why on earth would anybody cover up for a known child predator? Adverse publicity? For heaven’s sake." In the wake of the Sandusky scandal, Paterno was forced out and died shortly thereafter. In the New Yorker interview, Spanier lauded the late coach for his integrity. "He had tremendous energy, he had great enthusiasm for life, he had tremendous integrity, and I would say this to anybody — he was tough on the rules. He was always trying to do the right thing," Spanier said, according to The New Yorker. After the release of the Freeh report, the NCAA fined Penn State’s football program $60 million — roughly the amount the team has earned annually — to be applied to fighting child abuse. The college athletic governing association also cut the number of football scholarships Penn State can offer in coming years and erased more than a decade worth of football victories from the official record. That meant Paterno was no longer the winningest football coach ever. Spanier told The New Yorker that Penn State’s decision to accept the Freeh report conclusions was probably an effort on the part of the university to put the scandal behind them as soon as possible. "Unfortunately, what the university did was to accept the report. Not to receive it, which I think an organization would generally do, but to accept it. By accepting the report, the N.C.A.A. and the Big Ten then said, well, if the university accepts this report, we accept it, so we don’t need to do an investigation. They’ve signed an agreement with us saying it’s a done deal, we accept it, and they imposed the most severe set of penalties in the history of athletics."